We had heard plenty about Lima, Peru before arriving, most of it negative. People told us that it was dirty, and big, and dangerous and menacing – that we should spend as little time as possible there. We ended up staying 5 and a half days…and we quite liked it. Sure it’s big (>10 million!) and somewhat dirty, but there are plenty of parks and squares to explore and with the current ‘recuperacion’ of the city occurring, there is renewal everywhere. It is much cleaner than I expected. In both Miraflores (the tourist district) and Barranco (it’s more bohemian neighbor) there are roving bands of cleaners, street sweepers and gardeners, all in uniform, generally spiffing the place up. As for dangerous and menacing, I’m sure there are areas that one should not visit and I know we stayed in well populated, popular places (Miraflores, Barranco, and the downtown) but we never felt unsafe or uncomfortable even. The traffic is crazy!! I have never seen anything like it. The roads are filled to capacity with cars, truck, buses, motorcycles…anything that can move. And, although there may be lane markings, they are never used. Drivers must know every inch of their vehicle because the cars next to them are within inches whether moving or stopped at a light. And yet I did not see even one accident, not even a bumper touch – the taxis we took amazed us at their ability – we always felt we would arrive safely. Another thing we notices was the level of security. Armed guards and National Police were everywhere and, during the changing of the guard at the Presidential Palace downtown, there were police in riot gear even. 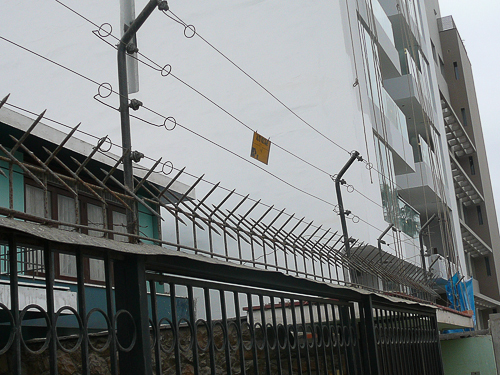 Buildings all have secure entrances, usually they are walled (complete with barbed wire and electric fencing) and have a gate with a guard behind. I wondered if this level of security was needed for historical reasons or if it really was that dangerous here. We had been feeling completely safe and had not seen any roving bands of hooligans and such. Was it a case of ‘we’ve always done it this way’ and so this level of security was just the norm? Our visit to the National Museum provided a few clues. There was a photography exhibit there showing the extent and brutality of the attempted cultural revolution by the Shining Path guerrilla group in the 1980’s and 1990’s. This group was extremely violent and wide spread, extending themselves from the villages in the highlands to the city of Lima itself. Although the main activity was curtailed by 2000, there have been incidences as recently as 2004 in Lima. Historically, too, security has been paramount and so the gates, and locks, and barbed wire and guards didn’t seem so extreme. Our homes in Canada may have looked the same had we been subject to such terrorism. 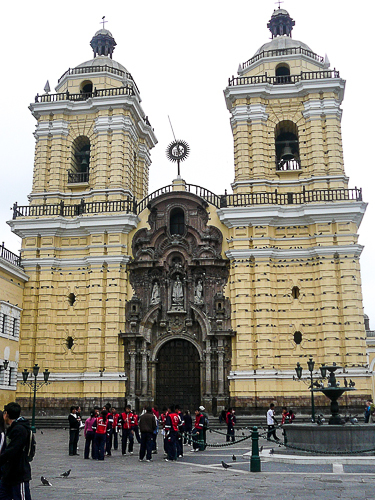 There was plenty to see and do in Lima…. We walked a lot to see the neighborhoods of Miraflores and Barranco. We visited the San Francisco Cathedral and saw the catacombs with all the bones. 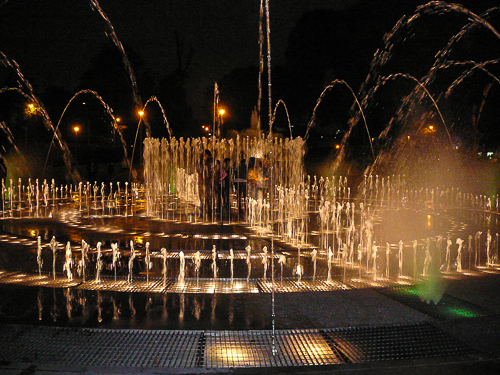 We went to the Parque de Reserva and saw all the waterfountains there. After 5 days though I was ready to go, and so we set out to our next destination…Cusco. Glad to see you enjoyed it – I’ve probably heard more negativity about Lima than anywhere else in South America, and being a city lover, I always thought it can’t be all that bad. 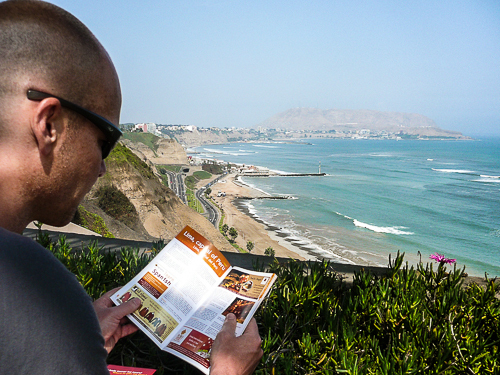 Looking forward to it much more now – which area would you recommend staying in – Miraflores or Barranco? Geoff — I think you would really like Barranco. It’s definitely less touristy and, with your spanish knowledge, you will find it easy to get around. 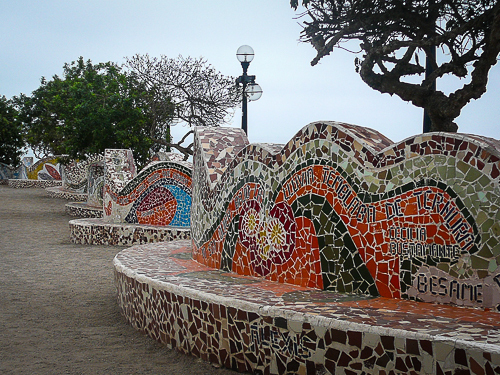 Miraflores is really nice so be sure to visit there also. Sounds like a good kick-off to your adventures. Don’t be afraid, but be wary. Play safe. That’s so awesome, guys! I’m really excited you’re finally on the road. …I would be lying if I told you that reading this entry didn’t make me feel nostalgic. Especially since you started with the same first destination as me. Glad to hear you also had positive things to say about Lima. Agreed on the traffic, but I can’t wait to hear your thoughts on Mumbai traffic! Glad you liked Lima – we did too. Security was noticeable when we were there 4 years ago but I’m guessing they’ve tightened it up since they’ve had some huge protests and strikes over the last year. But nothing compared to the Shining Path stuff. I concur with the above sentiments. I’m glad you enjoyed your first foreign stop on your trip. I really like the picture of the cathedral and the fountain, good stuff. If you think the traffic there is bad, just wait until you get to Asia. It will blow your mind! The last picture of the water fountain is awesome! Isn’t it great when a place is better than you expected? I’ve had that happen. So glad to hear…. thanks for the fabulous photos and newsy update. Glad you liked Lima. I had only heard good things and I’m glad that held true for you. and if you think that traffic is bad? wait until you get to asia! Great informative post.. I think any traveler when they play it safe in a city with a known reputation to be on the dangerous side will be on the good track..
this was a nice informative post thanks for sharing it in the mid of your travels.. with great photos..
Traffic.. I lived in Canada for near 7 years and when I came to Jeddah I was on the edge of my seat every time I went in a drive in the car the 3 lanes into 5 lanes and red lights are on and still cars were passing.. your going to see worst.. 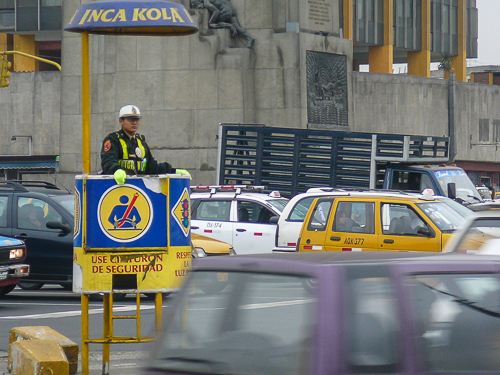 I had heard bad stuff about Lima too but was pleasantly surprised by the city. My girlfriend’s sister lives in Lima and made for an excellent guide. It is the first city that I have seen that partly looked like a fortress due to the extensive personal protection all the houses has. There are plenty of good stuff to see in the city and although it has one of the worst security reps around I felt perfectly safe travelling around in Lima. Lima deserves a better reputation!